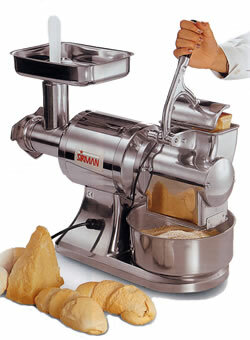 BrickOvens.biz is now offering commercial cheese graters, meat grinders, and food processors. Please contact us for purchasing and delivery info. Manufactured for the most up to date needs of commercial kitchens, hotels, restaurants, bakeries, and pizza makers. With built-in cheese-bread grater. 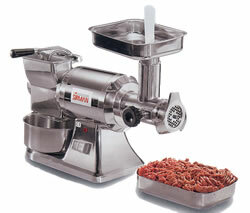 Also suitable for the preparation of meat sauce and hamburgers and similars. The biggest output in cheese grating. The HP series of cheese graters utilize the latest technology in restaurant equipment, with a painted bases and polished stainless steel housings for easy cleaning and optimum safety. Aluminim head and stainless steel drum completely removable without tools for an easy cleaning and a perfect sanification. Motors of model HP2 and HP4 are self-cooled for a high performance on continuous use. Stainless steel sieve available for bread grating. Signup for our Culinary Toys email newsletter!